In a Fog over the Cloud? We bring clarity to the role technology plays in your strategic objectives. Technology is a tool. Yes, you do need a website (probably), but more than that, you need to know how to align your website with your strategic objectives. If that resonates, then we need to talk. Free Evaluation! Check Out Our Work Signup for a FREE Evaluation of your website now! *Don't worry, we know our stuff. It'll be worth your while. We begin with understanding what kind of results you want to achieve. Do you want to generate sales leads, raise awareness or sell products online? A great site is not defined by design and function, but by effectively achieving the goals you have set for it. 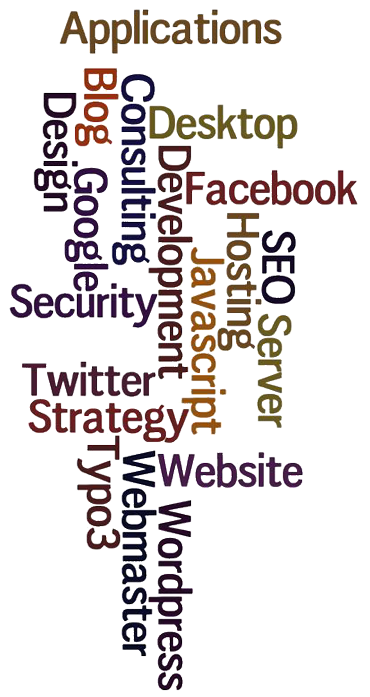 We’ve worked with a broad range of IT and web technologies over the past 25 years. Constantly learning new applications, we know how to combine proven principles with new advances that will achieve your goals. Many companies try to fit you into their mold. It's hard to stand apart when you look just like the rest of your market. We want to be a part of your team, not a website vending machine. You shouldn't have to learn a new language to work with your technology team. We're fluent in English and Geek (and know when to use them). Chris Blair is my CIO (Chief Information Officer) and is integral to guiding and executing multiple strategic internet-based marketing solutions. Many of my clients have chosen eBLAIR Solutions to support their IT and web initiatives. I willingly stake my reputation on the services of eBLAIR Solutions. Your business probably already has a website. At this time, it may not be an important part of your marketing strategy. In fact, it may even be an albatross to your advertising effort. We can help you understand what role your website plays and how to use it to engage your prospects, enticing them to take a step closer to you. After all, your prospects want to be engaged. The question is if they will engage with you or your competition. There are a lot of moving parts in a website calling on different skills and understanding. Few designers are skilled in the configuration and operation of the hardware and servers behind the solution. We have a lot of experience hosting websites (windows and linux), maintaining databases, configuring DNS, deploying SSL and supporting email and all the Geek stuff to make your web strategy perform. We host dozens of websites on linux and windows, maintain hundreds of domains, and have relationships with the top hosting companies and data centers around. We specialize in providing IT support and services to churches and ministries. We understand the unique elements of your environment and the importance of mission to everything you do. Our best fit is in providing part time and on call support and consulting. We really like to support your volunteers or local "Tech Stars" by providing a safety net of expertise and experience during business hours. We'll help create a custom plan to fit your needs and budget. It's easy to get started. Sign up now for a FREE evaluation of your website. You'll get a quick list of observations, suggestions, and resources to help you take the next step. Or, simply contact us to discuss a next step that fits your needs. Copyright © 2013-2017 by eBLAIR Solutions, Inc. All Rights Reserved.